From the outbreak of war in August 1914, there was no doubt that the Law Society of Upper Canada firmly supported the war effort. Treasurer George Shepley convened a special meeting on September 2nd to afford Convocation "an opportunity to decide, in advance of any pressure at all, whether from within or without, what its course should be." At that meeting the Benchers subscribed $10,000 to the Canadian Patriotic Fund. During the course of the war, Convocation pledged more than $25,000 to charitable organizations that sought to relieve the suffering of soldiers and civilians. The Canadian Patriotic Fund was the principal beneficiary, receiving over $20,000. Smaller sums were granted to the Belgian Lawyers Relief Fund, the British Red Cross Society, and the Navy League. 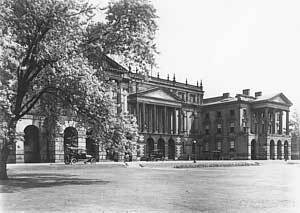 In addition to contributing financially to the war effort, the Law Society permitted Osgoode Hall to be used for military purposes. In February 1916, the Benchers granted permission to the 134th Battalion to use classrooms for lectures. 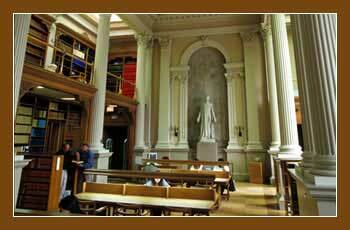 Possibly recalling stories about the damage that had occurred when Osgoode Hall was occupied by troops at the time of the Rebellion of 1837, the Benchers put strict conditions on the use of the building. The men were to be marched into the lecture rooms under the direction of an officer, and marched off the grounds afterwards. The Battalion was ordered to clean the rooms and pay for any electric lighting they used. The Law Society also played an important role in matters more directly related to the war. The Benchers promoted the training of troops through the Osgoode Hall Rifle Association and enacted measures that encouraged law students, members and Law Society staff to enlist. Founded in late August 1914, the Osgoode Hall Rifle Association was the first of many such associations formed in compliance with regulations of the Militia Act at the outbreak of the war. Its founding members responded to the "practically unanimous feeling that we [the legal profession] should be actually doing something to show our willingness to be prepared for any eventualities." The objects of the Association included taking a "useful part in military preparedness" and stimulating "a patriotic spirit in the community which shall ensure an immediate response of sufficient recruits of the best calibre." Membership was open to judges, lawyers, law students, legal officials, and others associated with the law. Members paid an enrolment fee of $1 for students and $4 for barristers. 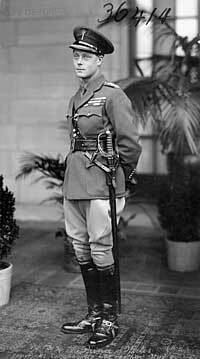 The Association's Captain was Major B. Holford Ardagh, who later became Secretary of the Law Society . From late 1914 to late 1915, its nearly 300 members held 34 drills and underwent a "considerable amount of rifle practice." They used three Ross Rifles and three target rifles that the Law Society provided, as well as Winchester Rifles loaned by the City of Toronto. Target practice took place at Long Branch Rifle Range in the City's west end, at the Armouries behind Osgoode Hall, and at a miniature rifle range on the grounds of Osgoode Hall. By January 1916, 350 members appeared on the Association's roll, but its activities were diminishing and drills were discontinued because many of its members, its Captain included, were in active service. The unused ammunition was sold. The Association was in debt for more than $200 that year, a sum that the Benchers at Convocation voted to cover for the Association's Treasurer, R.S. Cassels. During the height of its activities in late 1915 and early 1916, the Osgoode Hall Rifle Association not only trained its members for military service, but encouraged them to enlist. The Association targeted law students in particular. 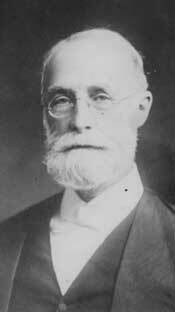 In response to Ardagh's suggestion that regulations be passed to force students to drill with the Association or to join a city regiment, Principal Newman Hoyles was asked to report "at once as to military affiliations of all students in attendance at Law School" and to identify "those who may not be able to drill on account of physical disability." From early on, Benchers encouraged law students and lawyers to enlist. 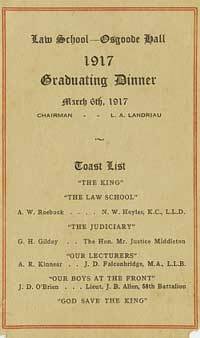 In February 1915 Convocation voted to allow students to advance one year without examination if they were to volunteer, enlist, qualify, and go to the front and "return in good standing and having borne themselves as members of the Law Society and soldiers ought to do." Third year students could be called to the bar without examination. Later in 1915, Convocation decided to remit the fees of all lawyers engaged in active service. While this would not have been an enticement to enlist, it demonstrated the commitment of Benchers to the war effort. Similarly, Benchers granted leaves of absence to staff who wished to serve overseas. Henry Haight, an assistant librarian, was granted a leave of absence for one year with half pay in 1915. He was still on leave early in 1917. Occasionally Benchers expressed the desire for more heavy-handed measures to ensure that students in particular do their duty in the war. The Benchers expected able-bodied students and many members to enlist, and to share their keen support for the war effort. Occasionally individuals suspected of not supporting the war to the standards of the Benchers were called on to account for their behaviour. In early 1916 a first year student found himself before the Discipline Committee, accused of having made treasonable statements in an interview with a Massachusetts newspaper. The Chief Press Censor for Canada had reported him to the Law Society. The student claimed that he had been misquoted and "that he did not make use of any expressions which indicate hostility to the Allies, or cast any reflections upon Canada's connection with the war." The Committee ordered the student "to be careful in future about statements that he makes." Late in 1917 another member was brought to the attention of the Committee because he had allegedly claimed exemption from military service on the grounds of being Austrian. The member denied that allegation, explaining that he had asked for a medical re-examination on account of his eyesight, but that he had since withdrawn any claim he might have had on physical grounds to exemption. Recruitment efforts among the legal profession and law students were extraordinarily successful. Altogether about 300 lawyers and more than 200 law students served in the First World War, a remarkable number considering that there was a total of about 1,700 lawyers in the province in 1918. "Keeping the Home Fires Burning"
Throughout the war, Benchers were concerned not only with supporting the war effort, but also with ensuring that the Law Society ran smoothly, and that Osgoode Hall and the people in it were adequately protected. For the most part, the work of Convocation proceeded normally, and the Benchers continued to deal with admission, discipline and administrative matters. In June 1917, the Benchers agreed to dispense with their luncheons for the remainder of the war except on the occasion of the annual meeting. This may have been a cost-saving measure as much as a symbolic sacrifice on the part of the Benchers. The war had a serious impact on the Law Society's finances. By October 1917, the Benchers reported a deficit of more than $11,000 during the preceding year and they predicted a deficit of $14,000 for the ensuing year. This situation had arisen because of the large sums the Benchers donated to charities, but also because of the loss of fee revenues with so many members and students exempt from payment. The Benchers attempted to make up the shortfall by introducing a fee of $10 for each examination for the duration of the war. Many staff went overseas on war service and replacements had to be found to keep things running smoothly. Law school demonstrator Mr. Foster had gone by September 1915, and senior examiner G.F. McFarland and assistant librarian Henry Haight both went overseas in January 1916. Shortly after the outbreak of the war, the Benchers began to take steps to secure Osgoode Hall. 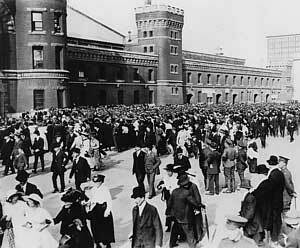 Security procedures were put into place early in 1916. Doors would be closed outside of office hours when the law school caretaker, Thomas Jones, would control the main law school entrance. Guards patrolled the property 24 hours a day and at night the grounds were lit up, and some of the fence's gates locked. The Law Society also had to comply with government wartime regulations. 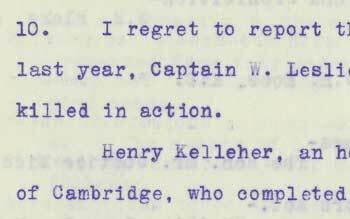 The law school and the library closed for three days in early February 1918 in response to an order from the Fuel Controller. Also in 1918 Law Society employees paid income tax for the first time under the new Income War Tax Act. 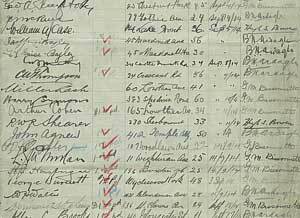 Throughout the war, the Society kept track of the students and lawyers who had enlisted. Lists were drawn up showing the numbers of those on active service, the number who had died while on active service, and the military honours that they had received. A list dated December 1st, 1917 showed 216 students and 252 lawyers on active service, of whom 31 and 26 respectively had died. The first Law Society members killed in action were Captain W. Leslie Lockhart Gordon, a 1914 graduate, and Henry Kelleher, a second year student. Their deaths were recorded in the Minutes of Convocation in June 1915. Their passing was marked with a quotation in Latin from a patriotic English poem, translated as: "Who died far away, before his time: But as a soldier, for his country." The death of Charles Moss at the age of 41 affected the Benchers deeply. 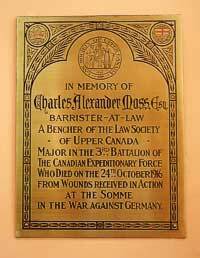 Charles Moss was one of their own, the only Bencher to die on active service. Greatly admired, Major Moss was "one of the most prominent men who have yet gone to the front from Toronto: one of the brightest lights in the legal profession; a man who was prominent alike for his personal qualities and intellectual attainments; and was loved and respected as few men are privileged to be." The Benchers ordered that a brass memorial tablet in his memory be placed in Osgoode Hall, where it remains today in the Benchers' Quarters. Occasionally poignant references to the war dead appear in the record of Convocation. In May 1917 a poem, "War: A Sonnet", by Major J. Miles Langstaff, "the well-known young Toronto barrister" was copied into the Minutes. The handwritten sonnet had been found on a sheet of paperamong Major Langstaff's effects after he had been killed in action. In March 1921, the mother of lawyer Cecil J. Bovaird, who had been killed in May 1917, donated a framed photograph of her son to the law school, on the walls of which the photograph hung for many years. The military accomplishments of some members were mentioned at Convocation. 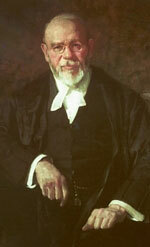 Newman Hoyles, Principal of Osgoode Hall Law School, was an enthusiastic booster of the war effort. In the Principal's Report of May 1918, he noted: "We are proud to notice not only the number of members of the legal profession … who, at the call of King and Country have sprung with alacrity to arms, leaving the 'brawling courts and dusty purlieus of the law,' but also their brilliant achievements in this unfamiliar service." He went on to note that H. Brooke Bell, youngest son of a former Law Society Secretary, had been awarded the Military Cross and the 'al Valore Militare' Medal from the Italian Government for conspicuous gallantry. Law Society staff and Benchers spent a lot of time documenting the role of members in the war, a task that went on after the war ended as plans for the war memorial began to take shape. The End of the "War to End All Wars"
The financial situation of the Law Society improved rapidly once the war ended, and in October1920 the financial statement recorded a surplus of more than $84,000 for the preceding year, mainly due to students' fees. Soldiers returning from the front flooded into the law school. In his reports to Convocation, law school principal Newman Hoyles had argued for post-war planning. He asked the Law Society to consider the problem of re-integrating returning soldiers into the legal profession: "not all who come back after active service will be able to settle down … to the drudgery of ordinary work… In regard to other walks of life plans are being already thought out for welcoming and, where necessary, assisting those who will come back, some disabled more or less owing to wounds and illness." Apparently the principal was discouraged from this pursuit. The following year he noted that special provision would have to be made for some returning soldiers who wished to pursue their legal studies, "but it is, I fear, too early to deal with the problem at present." Once the students were back measures to accommodate them had to be made quickly. While most of the post-war planning involved provisions for students, occasionally they addressed broader issues. Mid-way through the war, in October 1916, a Special Committee to consider post-war conditions, apparently formed in response to a request from the Senate of Canada, reported to Convocation. In addition to recommending that plans be made for looking after returning soldiers and assisting them to find employment, the Benchers made suggestions in the areas of public works expenditures, immigration, relations between capital and labour, and trade and commerce. Exactly what they meant by these suggestions is not clear because there are no records that fully explain their recommendations. In order to accommodate the influx of returning soldiers who wished to start or resume their legal studies, Osgoode Hall Law School offered summer sessions in 1919 and 1920 in addition to the regularly scheduled program. The summer school was available only to war veterans and consisted of the second and third years of the law school program. Since veterans got a year off law school, there was no need to offer first year courses in the special summer program. Dozens of returning veterans availed themselves of this opportunity to speed up their legal education. Numbers at the law school swelled during these years, and the two parallel law school programs meant additional burdens for the professors, lecturers, and administrative staff. Those who taught the summer school were paid $500 for the extra term. In each of the years 1919 and 1920, two law school classes graduated, and separate class photographs were taken. One dilemma that emerged from the summer program involved prizes awarded to the top graduates each year. The Benchers deemed that graduates of the summer school were not entitled to medals because they had not achieved academic excellence in the "regular" program. Almost half a century later the Benchers decided that this decision had been unfair, and in 1964 they awarded gold, silver and bronze medals to those who should have received them years before. Words from the "Mother Country"
In the later stages of and shortly following the war, several British dignitaries visited Osgoode Hall. The Benchers were keen to hear distinguished speakers from the Mother Country, three of whom were Law Society guests in the years 1918 and 1919. These visits demonstrate the close link that the Benchers felt towards Britain, and their desire that the British recognize the contributions that Canadians and its legal profession in particular had made to the war effort. The first visit took place in Convocation Hall on January 21, 1918, when English Attorney-General Sir Frederick E. Smith addressed a large group of Benchers, judges and lawyers. Sir Frederick spoke on law and lawyers in relation to the war, "which he spoke of as being in a very important sense, a lawyers war because upon its result depended the answer to the question whether or not international and public law were to survive in the world." Edward, Prince of Wales (later King Edward VIII) visited Osgoode Hall during his tour of Canada in 1919, during which the Benchers conferred the degree of Barrister-at-Law upon him and elected him a Bencher. The Prince referred to the contributions that the Ontario legal profession made to the war effort in his remarks: "I do want to express to you my admiration for the wonderful war services of this inn. You had 300 barristers serving in the war and still almost more wonderful, out of 350 students, you had 300 serving at the front. I do congratulate you most heartily on such a record. With you I mourn the loss of those 70 barristers and students who will never return. I offer to you my deep sympathy for the splendid men you have lost." Less than a month later, on September 17, 1919, the Benchers gave a luncheon to Lord Finlay, who until recently before had been Lord Chancellor of England. Lord Finlay commented on legal education, and emphasized the necessity of wide reading outside the subject of pure law. He advised that students "should not confine themselves to the study of law alone, if you do, you will not be a good lawyer, you must remember that the law concerns itself with mankind and is as broad as that word." Lord Finlay went on to speak about the value of esprit de corps in the legal profession. "I have always thought," he said, "that the Bar was the noblest of professions - that is of civilian professions. But now we must all put in first place the navy and the army." The Benchers and their guests must have been extraordinarily gratified by the honour that these dignitaries bestowed on the Law Society by their visits, particularly that of the Prince of Wales and his explicit reference to the splendid war-time contributions of the Ontario bar.